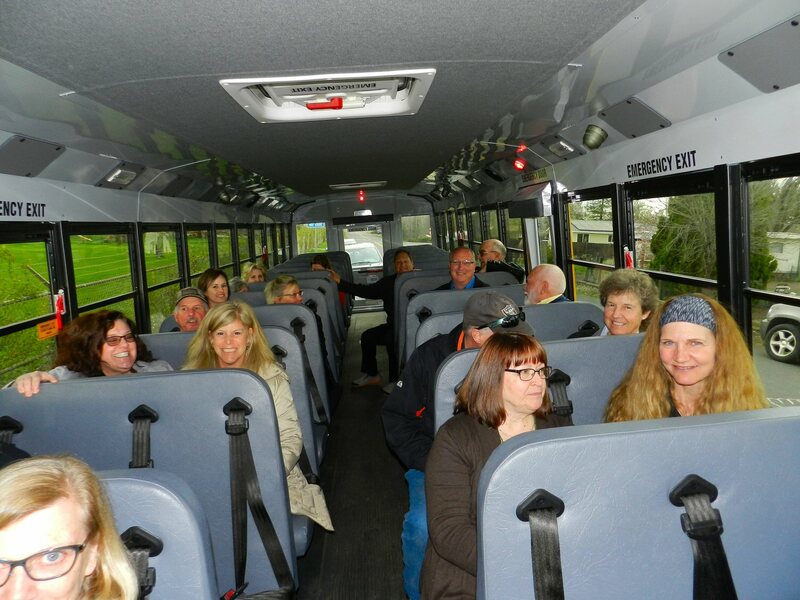 Before the April Board Meeting of the Fall River Joint Unified School District on April 11, Head of Transportation Lori Barber and Head Mechanic Larry Betz took the Board of Trustees for a ride on the district’s new electric school bus. 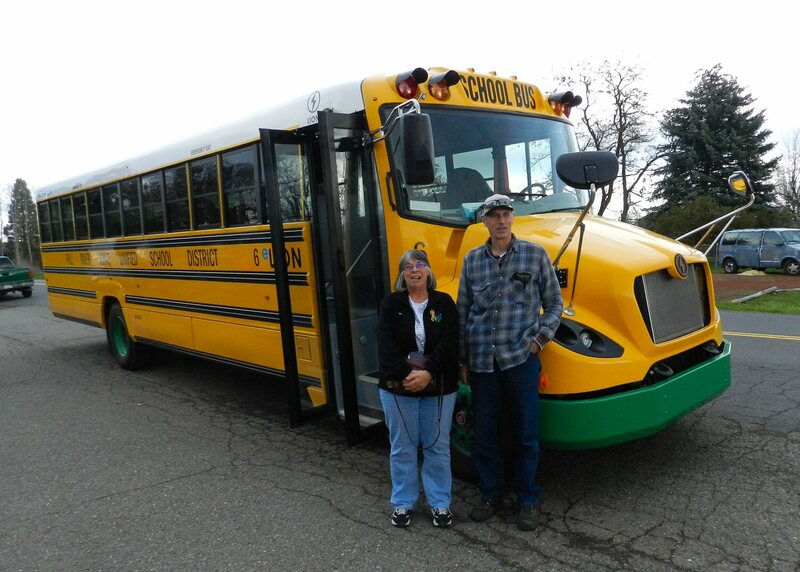 The aqusition of the bus was made possible through a grant provided by the North Coast Unified Air Quality Management District as part of the Rural School District Bus Pilot Project. 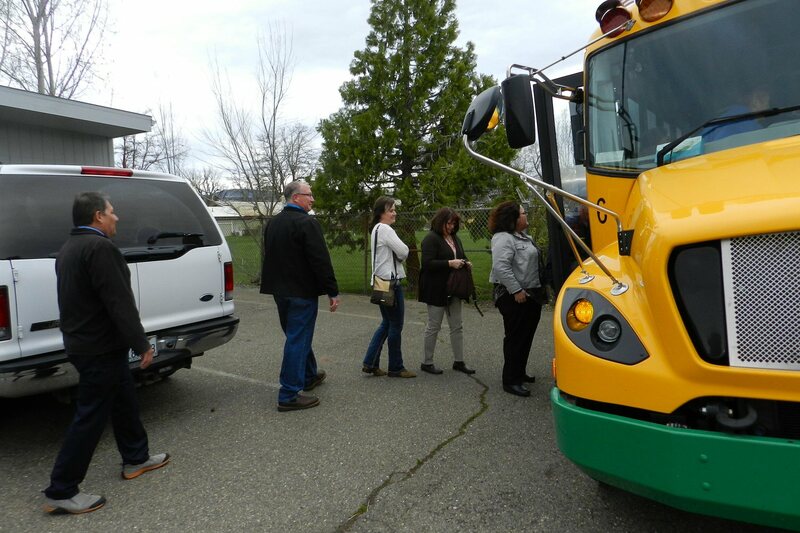 The main goal of this grant program is accelerating the turnover of California school bus fleets to lower carbon transportation choices, especially in rural school districts who have less access to other funding sources. The new zero-emission bus, powered by battery, can seat up to 71 children depending on age and size. It has six emergency side exits and two emergency exits in the ceiling. After a fifteen minute drive in and around McArthur, Mr. Betz parked by the Fall River High School, where Ms. Barber gave information about the bus and answered questions. The bus cost $403,000, as compared to about $160,000 for a traditional diesel powered bus. It can go 100 miles on fully charged batteries, but Mr. Betz explained that would be on “flat ground on a hot day.” In cold weather it takes energy to warm the bus, and climbing hills demands the use of more power. It takes three and a half to four hours to recharge the batteries. Accordingly the new bus will be used for two suitable routes, the Big Eddy-Fall River route and the Dana-Glen Burn route. Burney would also be good but sometimes has 78 or 79 students so capacity would not be adequate. Mr. Betz also demonstrated a safety system to insure that no child would be left on the bus. The bus driver has to inspect the bus and push a red button at the back of the bus when he stops. If he turns off the ignition and exits the bus without pushing the red button it will trigger an alarm. Red lights will flash and the horn will begin honking. After Ms. Barber finished answering questions, the bus returned to the School Board office so that the Board could conduct it’s monthly meeting. The ride was enjoyable and informative. Mr. Betz didn’t have to issue any tickets for bad behavior. During the meeting the Board unanimously approved a resolution to participate in the Rural School Bus Pilot Project. Another grant has also been approved for the acquisition of a second bus in the future.